You can resume a quiz you previously started. 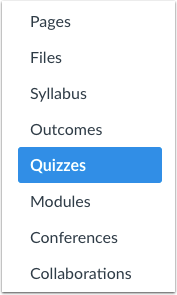 If you navigate away from an unfinished timed quiz, the timer will continue running and the quiz will autosubmit when time runs out. If your instructor changes the due date of a quiz that you have already begun, the quiz will auto-submit based on the date and time of the original due date. Find the quiz you would like to resume and click the title of the quiz. To resume the quiz, click the Resume Quiz button. The quiz will resume where you left off. When you are finished, you can submit the quiz. Previous Topic:How do I answer each type of question in Quizzes.Next? Next Topic:How do I submit a quiz? Table of Contents > Quizzes > How do I resume a quiz that I already started taking? Re: Can I "re-open" or moderate a quiz for a student to answer unanswered questions?